This family-friendly multilevel beachfront home sits directly on the beach and Emerald Coast. It comfortably sleeps up to 18 adults and is ideal for two families. Under new ownership as of October 2018, this designer’s own home is sparkling clean and hypoallergenic. It hosts new furnishings, including all new mattresses, pillows, linens and upholstered furniture. The front door opens to a bright entryway with stairs on either side. The left staircase leads to a large master suite with its own wet bar and kitchen with Keurig. In addition to the king bed, there is also a queen sofa sleeper. The ensuite bath offers a double vanity and large walk-in shower. This room has a beautiful Gulf front view and opens onto its own private deck with an outdoor daybed. Go back out into the hall and up a few steps, and there is a cute loft area with two twin beds with two twin trundles, perfect for the kids. Back down in the entryway, the right staircase leads to the main living area. This is a spacious open floor plan with dining room, large flat screen TV, wet bar, queen sleeper sofa, and plenty of comfortable seating to enjoy the many windows and their view. The galley style kitchen offers much work space and a breakfast bar. There are two more bedrooms off the kitchen; one with a king bed and twin sleeper chair and one with two sets of full over full bunks. These bedrooms share a hall bath. There is another half bath and laundry area on the entry level. The Gulf side deck is large and open, great for sunsets and grilling. Below the master suite deck is another, private deck with a hammock and enclosed outdoor shower, providing a large shaded area. All of the Gulf front decks provide options for sunbathing or relaxing in the shade with plenty of luxury outdoor seating options including hammocks, swings, chaise lounges and outdoor daybeds. Curl up with a book in the shade or share a cocktail at the table as you listen to the surf. There is also a two-car garage with plenty of storage for floats, bikes and other beach gear. Happy memories await at Salt and Light Beach House, beach front, Pensacola Beach. Thank you guys so much! My family enjoyed our stay to the fullest! It’s was clean, decorated beautifully, and we was on the beach with the BEST VIEW! We will be back this summer! Thank y’all team for the best hospitality! Thank you for taking time to post your review about your stay at 706 Ariola Drive. We're so glad to hear that you were happy with the cleanliness, decor' and views of the beach from this home. We appreciate your business and look forward to your return this summer! 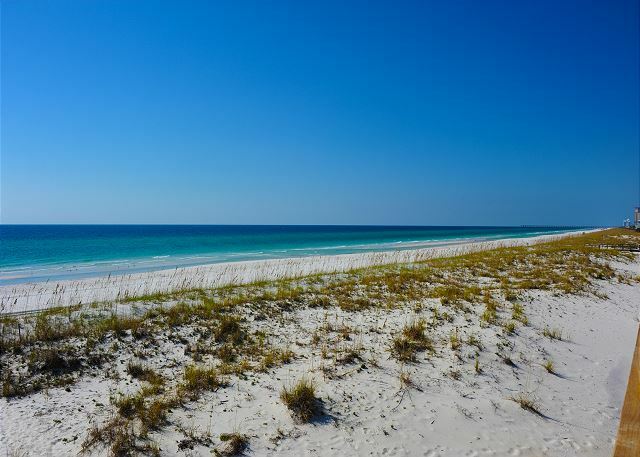 Pensacola Beach has some of the most beautiful beaches in the world. We're happy to hear that you enjoyed our beautiful beach and look forward to your return! Perfect location right on the beach close to relatives. Enjoyed coffee on the deck each morning and drinks in the evenings. The rooms and bathrooms were large. Very spacious. Thank you for your review of 706 Ariola Drive! We're glad to hear that you enjoyed your stay and we look forward to your return! This was the 3rd time renting this beach house. We loved that you walk out the door and your on the beach. The outdoor shower was helpful. We had 2 small children and when they were napping the baby monitor range reached our spot on the beach. The bedrooms were comfortable and the kitchen was clean. The mini bars ice maker was a great touch. The air was cool the whole week. The house is bigger than it looks in the pictures and you can't hear folks on the top floor, which was great. The kitchen is well equipped and spacious and we loved the two pantries and the wet bar space with ice maker. The upstairs was not as clean as the downstairs. Paradise is always responsive to needs, questions. Overall great experience! Wonderful beach home. Would definitely come back again. Love the open floor plan on the main level.Only suggestions would be to possibly have more containers in the home to put leftovers in with lids, more dish cloth and dish towels in the kitchen and more then one hot pads. Also, a couple of the slats on the top deck are loose and with having young children there, feel they need to be secured. Best beach access from this house! Wonderful outdoor shower! Ice maker is a must! We had a very good stay. The location is great. The rental property was very clean and in good shape. There were a couple of very minor problems but they were taken care of immediately. We have been renting thru Paradise Beach Rentals for several years and they have always been very nice and helpful. Look forward to coming back next year! Feels like we've come home we have stayed in this house with our family for years. It is a wonderful house for a family or two and we love it because we can bring our dogs. it is about as close to the beach as you can get and has everything that you would need. Lovely, family and pet friendly home directly on the beach. Good. We would rent this property again. The location is great, the beach is wonderful. The home is ok. The layout is good for if you have 2 different groups as the home as the home is split in half at the main entry. Also could use to be aired out, I found out I'm allergic to somthing in the house. Very musty until we ran the AC for a day. Furnishings are hit or miss and really needs an update for what the owner is asking in rent. Stains, water damage and outdated furnishings. Still had a great time but for the cost I don't think I'd rent it again. Because it rained the entire time we visited the beach, we were more than happy to have such a lovely, spacious place. The great room offered lots of room for everyone to find an activity, and we were able to watch the gorgeous views of the storms on the Gulf. No response from RENTAL COMPANY when needed! Loved Cabin and location. Hated trashed garage, trashed bottom balcony and trashed area under and around house. Called and complained upon arrival and asked for someone to clean. 3 days later and 3 more calls ...NO RESPONSE! We cleaned some just to enjoy !!! Beer cans, bottles, trash, broken umbrellas, chairs, toys etc. everywhere. Paid a lot of money to have to clean it myself! Couches need to be cleaned badly. Would recommend caution only due to rental companies response. It was a great location and nice house. More towels would have been nice. If it sleeps 10, there should be 10 towels at least. Grill burners need replacing. Otherwise everything was great. The location of this home is amazing! It makes up for the over all appearance of the place. It is very dated and in need of some serious maintenance. I also think the cleaning service needs to be a bit more conscience of detail. i.e. cleaning the fans and vents to improve overall appearance. There also was food left in the freezer. Thank you for the feedback. The owner will arrive this weekend for a 2 week stay. Some needed maintenance will be addressed during this time. We have scheduled a deep clean of the unit after the owner departs. The house is in the perfect location, especially with small children. The house was the perfect size and layout but it is older and things don't work as well as you would expect. In the loft, the AC does not work at all, even the window unit does not cool down. The AC didn't cool the rest of the house really well either, but in October it wasn't a big deal. The outside doors didn't all close well and there was some sticking. We had everything we needed, the supply of towels was great and unusual for a rental! I would rent again in the fall, but not in the heat of summer. Perfect house for a family. As close to the beach as you can possibly get. A very quiet strip of beach with very little beach traffic. We enjoyed staying at 706 Ariola for a week with our two children and their families, which included grandchildren, ages 5, 3, and 18 mo. The house was spacious and perfect for nine people. We loved the short walk out the back door to the beach and it was a well-worn path during our stay! We especially enjoyed the shady back deck with the children. We felt like we had enjoyed a week in paradise! The house was awesome! Very spacious and has amenities beyond what they tell you on the website. We will definitely be back! The staff took care of us with whatever we needed! Thanks! We had an awesome time! We hated to leave this beach house. Beautiful view, convenient walk to the beach, the sound of the surf was amazing, put together two puzzles (500 and 1000 piece), visited with friends and had a terrific time! Highly recommend this location.